Powers/Abilities: The Green Terror's powers and abilities remain unrevealed. He claimed to possess immortality but needed a supply of fresh, healthy human blood along with herbal mixtures derived by rare native African plants to prevent his aging. 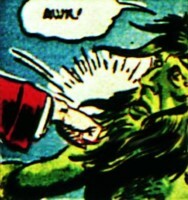 The Green Terror appeared to have a muscular build but did not possess superhuman strength or endurance. He displayed very limited fighting skills and relied on his criminal gang to do his bidding. The Green Terror's skin and hair pigmentation has been changed due to his immortality elixirs and is now permanently green. (Mystic Comics I#1/4 (fb) - BTS) - The man who came to be known as the Green Terror learned the secrets of immortality from a mysterious tribe inhabiting darkest Africa. After imbibing a mixture of healthy human blood with rare African orchids, the man increased his lifespan and grew stronger and more vigorous, but the side effect changed his skin and hair pigments to a sickly green color. The man, calling himself the Green Terror, created a small criminal empire based in South Africa. The Green Terror and his criminal gang hijacked and took control of the steamship S.S Caribou as well as put the ship's captain on his payroll. 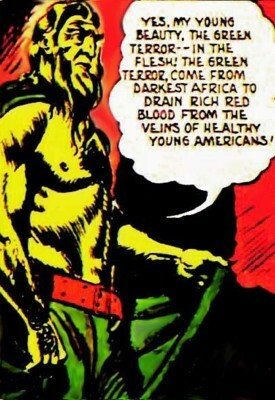 The ship later set sail to the United States to abduct rich healthy young Americans so the Green Terror could drain their blood and prolong his lifespan. The Green Terror successfully abducted several young men and women and his crime spree baffled the local police, who were unable to catch him. (Mystic Comics I#1/4) - The Green Terror's men abducted socialite Maisie Leeds in broad daylight while she was walking from a theater with her friend Carol Carson and quickly sped off in a car that emitted a noxious green gas that hid their escape from pursuing police. (Mystic Comics I#1/4) - The Green Terror soon learned that the world famous detective team, the 3 X's, were on his trail and he sent his gang to steal back a glove that belonged to one of his goons. The goons invaded the 3 X's headquarters and managed to take them by surprise and severely beat the detectives, then made off with the glove. In two separate incidents while onboard the S.S. Caribou, the Green Terror's men captured Carol Carson and Ted Barry (Maisie Leeds fiancé). The 3 X's were all looking for Maisie on the ship, and they were brought before the Green Terror. The Green Terror began to gloat about being the "world's strongest man" and boasted about his plan to drain the blood of rich healthy Americans to the captive 3 X's, but the great detective team called his plans a bunch of baloney and attacked him and his men. Taking the Green Terror by surprise, 2X hit him square on the jaw and the vile criminal crumpled to the ship's deck. 1X--using his fists--and 3X--with his handy disintegrator gun--quickly routed the Green Terror's men and they all surrendered. The S.S. Caribou was returned to port and the Green Terror and his men were taken away to jail. The 3 X's mentioned that the Green Terror would be sentenced to the electric chair for his crimes but this remains to be seen. The Green Terror could have possibly escaped or even deported back to South Africa to face imprisonment there where he could have been eventually released or liberated. It is unrevealed if the Green Terror was or ever became aligned with Nazi Germany since at the time, there existed a pro-Nazi South African movement called Ossewabrandwag that was responsible for committing various acts of sabotage against the country since South Africa was allied with Great Britain during WWII. The Green Terror's men wore costumes that resembled those worn by the terrorist organization Hydra. This could easily be ret-conned and shown as an early version of Hydra with the Green Terror in charge of Baron Strucker's faction stationed in South Africa. The Green Terror's criminal henchmen as a group did not have a name and I called them the Green Terror Squad just to distinguish them from any other groups or gangs. Until they can be identified by a writer in the pages of a Marvel comic, they will be referred to as this. He is self-proclaimed as coming from an ancient tribe of South Africa. But, he was initially illustrated as having golden skin. That might make him an Eternal version of the Khoikhoi. The full-bloods of that now-extinct tribe had skin pigmentation that was golden-brown, compared to the later Bantu tribes of the region. Indeed, the Khoikhoi's only living descendants, the Damara, are actually part-Bantu! Though it is not actually stated, I presume that this guy lived at least since the early 18th century. He looks old enough to me and with an increased lifespan he could even be older. Maybe the Green Terror returned as the mysterious Nocturne (from Marvel: The Lost Generation). In case Green Terror's gang had become Hydra agents. As Hydra loyalists of the original Supreme Hydra they could have gone their own way later and formed the Terror Masters (Captain America Comics#42 (10/1944) Captain America story). Both the Green Terror and the Hypnotist use human blood to maintain their youth. Perhaps they learned this similar method from the same source? Adventures Into Terror#3 (April, 1951) 4th story- "The Living Dead" has a similar character. green skinned Gamma Mutates such as the Hulk, the Leader, etc. (Mystic Comics I#1/4) - The Green Terror ran a criminal empire from South Africa and employed a formidable fighting group that wore green colored costumes. He sent his men to kidnap healthy young Americans for the Green Terror in order to use their blood to create his life extending elixirs. The Green Terror Squad captured Maisie Leeds and drove off in a car that emitted a noxious green gas to elude capture by the police and were later sent to attack the 3 X's at their headquarters and retrieve a glove that was left behind at a previous abduction site. They all were eventually defeated by the 3 X's aboard the S.S Caribou alongside the Green Terror and presumably sent to prison.